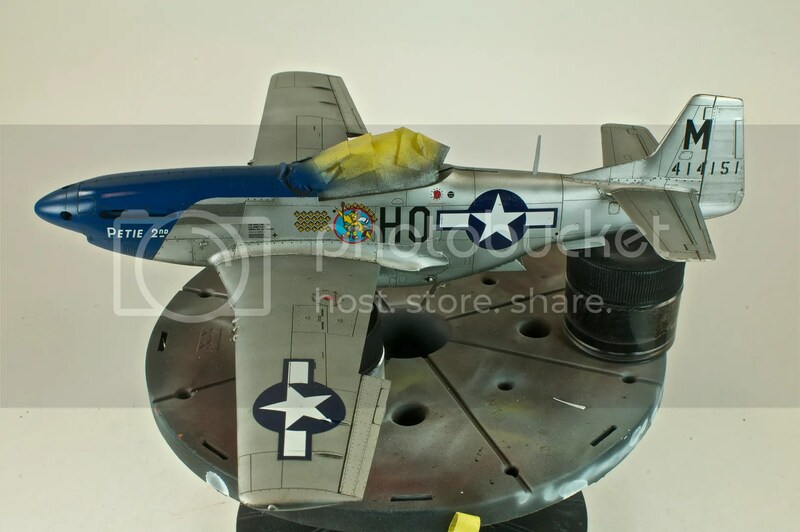 Now that the Mustang finally has the distinctive blue nose of the 352nd fighter group, it’s time to move into the home stretch. Tamiya’s kit actually includes markings for Meyer’s “Petie 2nd”. There’s just one problem: they’re Tamiya decals. That is, they’re thick, they don’t like to settle into panel lines, and they have a tendency to silver. While I was stuck for the call letters, nose and squadron art, and serial numbers, I wasn’t too keen on using the kit decals for the national insignia or the stencils. 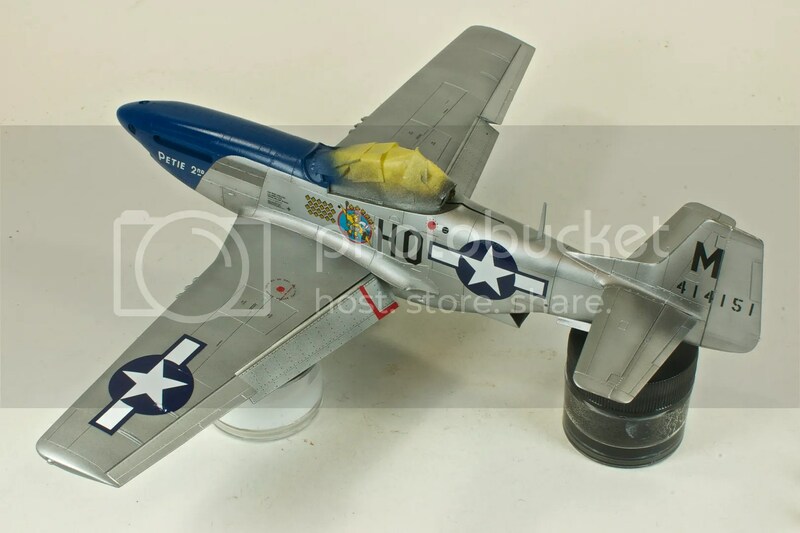 Instead I raided another kit – Tamiya’s 9th Air Force P-51D. The kit’s identical to the 8th Air Force kit, save the decal sheet, which is printed not by Tamiya, but by Cartograf. Since I’m planning different markings altogether for that kit, I jacked the decals, sprayed a coat of Alclad Klear Kote Gloss, and went to town. Everything went swimmingly. The Cartograf-printed decals performed beautifully, and there were few enough of the Tamiya decals that they weren’t much of a bother, either. Once the decals were on, I accentuated the panel lines with sludge washes of Flory Black (for the nose) and Dark Dirt (for everywhere else). As these dried, they were wiped from the surface with damp paper towels, leaving the washes only in the recessed panels. Once the washes had time to dry, I sprayed the Mustang with Alclad clear coats – Matte for the lacquered wings and Light Sheen for the main fuselage. Meyer’s “Petie 2nd” was far from the chromed up restoration birds you see at airshows, and I wanted to reflect that “ridden hard” feeling while still remembering that this was a CO’s personal ride. Stains were kept to a minimum, with MIG pigments used all around. Black Smoke for the gun staining, and layers of Burnt Blue Metal, Black Smoke and Russian Earth for the exhaust. Alongside the weathering, the landing gear, flaps, gear doors, and prop blades went on. Navigation and recognition lights were painted Model Master Chrome Silver, then topped with the appropriate Tamiya clears (Red, Orange, Blue, Green). The gunsight was installed, and finally, the canopy attached. With that…”Petie 2nd” is done! More pictures to come in the Completed Builds section once I get that put up. In the meantime, you can check out all the build and final photos over on Photobucket! Beautiful build on this 51. Good luck with your move, look forward to more posts. What do you do with your completed builds? Display? Store away? Am interested in how you handle this. My wife is getting nervous as my stash is growing. She is concerned there will be planes and tanks throughout the house. Of course, my kids would love that. So far I’ve been displaying the models in the computer room (the closest thing to “my room” in the house!) in an IKEA Billy bookcase with the glass doors and glass shelves. Works decently for armor, 1/48 aircraft and small 1/32 aircraft. I’ve been able to cram the Mossie and 1/32 109 inside, but the Spitfire doesn’t fit. The shelves are about 11″ deep. excellent! Thats a brilliant model! Congrats! 1. Do you put the decals directly on to the alclad finish (no gloss overcoat..) do you get silvering? (I’ve got the ‘Techmod’ decals). 2. I thought an overcoat after the decals spoilt the finish?